Never tried a Group Exercise class? If you’re still feeling unsure, try these tips from DeAnn Nicklay, who is a program manager at the Hudson YMCA. 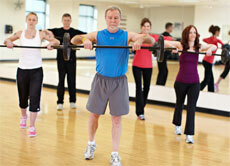 Group Exercise classes are designed to welcome everyone. While some classes offer more of a physical challenge than others, there are options for all fitness levels. You can also head to the Fitness Center at your local Y and a team member can recommend a few suggested class options for you, based on your fitness goals. When attending a new class try to arrive about 10 minutes early and let the instructor know you are a beginner. The instructor will be able to give you tips on how to get the most out of the day’s workout, tell you what equipment you need and will be able to offer alternate exercise options for you. It’s also a good idea to stand in the middle of room so the instructor can see your form—plus you’ll have the front row to watch for visual cues. My workout is for me. Class isn’t a competition, so don’t worry about keeping up with anyone—this is your time. My body will guide me. Instructors will provide options to modify exercises—choose the one that’s right for you. Everyone has a first day of class. And everyone’s had those moments when they mess up the choreography, or feel like they don’t fit in. Everyone goes through those thoughts and you are not alone. But try to attend a class three times before you make a decision about whether or not it’s for you.